I hope that you, my followers, all had a very happy Christmas; and that you’re all ready for a positive and successful year in 2016! My Christmas was very green but it was wonderful. I really felt the Christmas spirit this year, and it made not only the day but the whole season all the more rewarding and enjoyable. Upon my insistence, my family had a sit-down breakfast on Christmas morning. 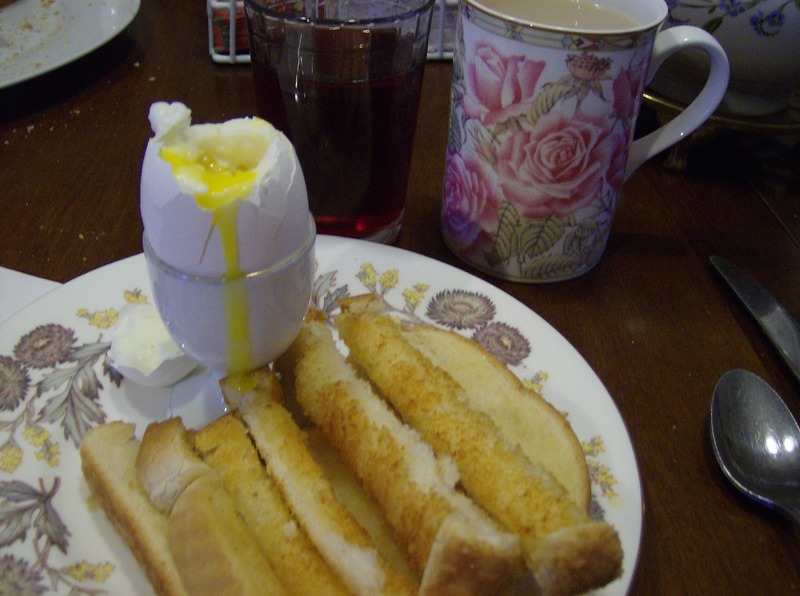 We had soldiers and eggs with Earl Grey tea which was a gift for Christmas! It made me very happy because it was so English, and I got to spend time with the family. 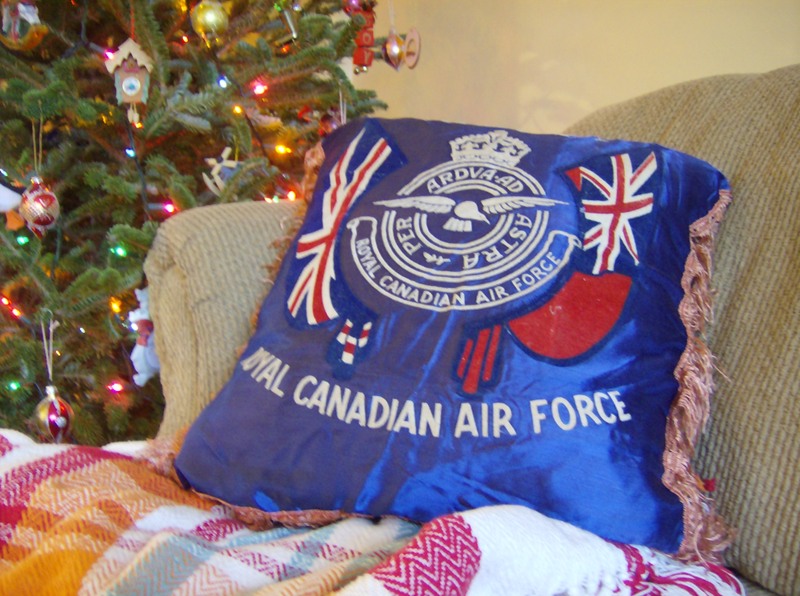 My brother and I adored soldiers as kids and continually begged my dad to make them for us! After breakfast, it was present time. 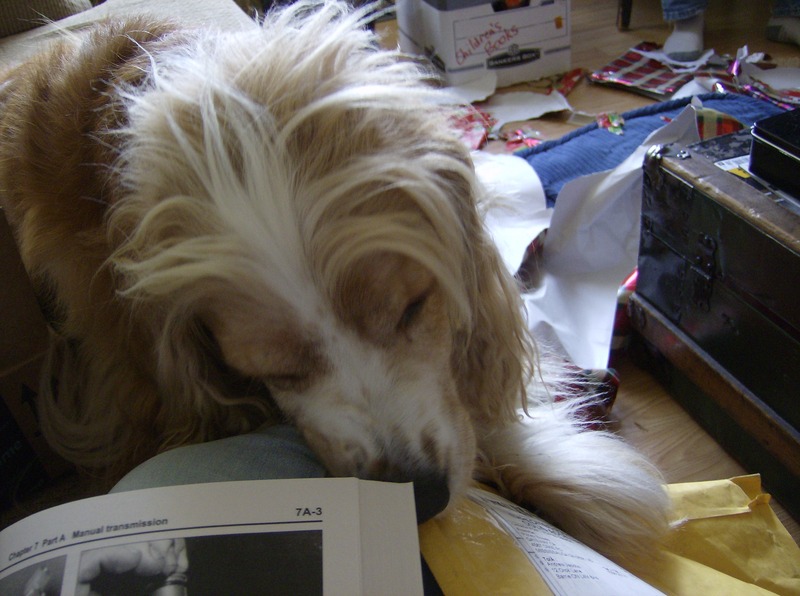 My dog Crumpet was, as usual, in the middle of everything– I think he enjoys the physical process of opening presents more than anyone else in the family does! He certainly insists on helping to open every present himself. My family spoiled me this year with gifts, and I don’t know why! I got a really nice combination of things on my wishlist and things which are ideal but which I didn’t ask for! On left, a shortwave radio– I can pick up transmissions from around the world and from aircraft as well! 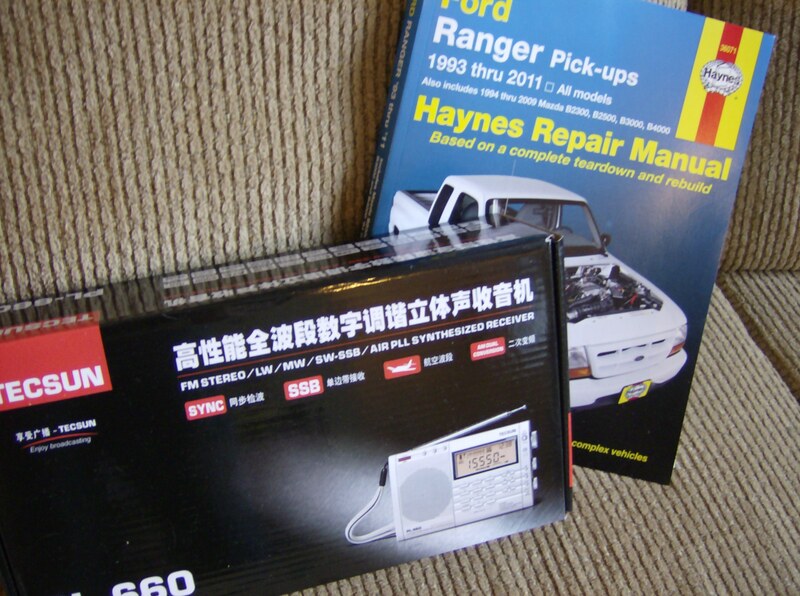 On right, a manual for the Ford Ranger/Mazda B-series trucks. We at Mitsubishi have a Ford Ranger as our work truck, and I love it. I’m considering buying one for myself, hence the manual! 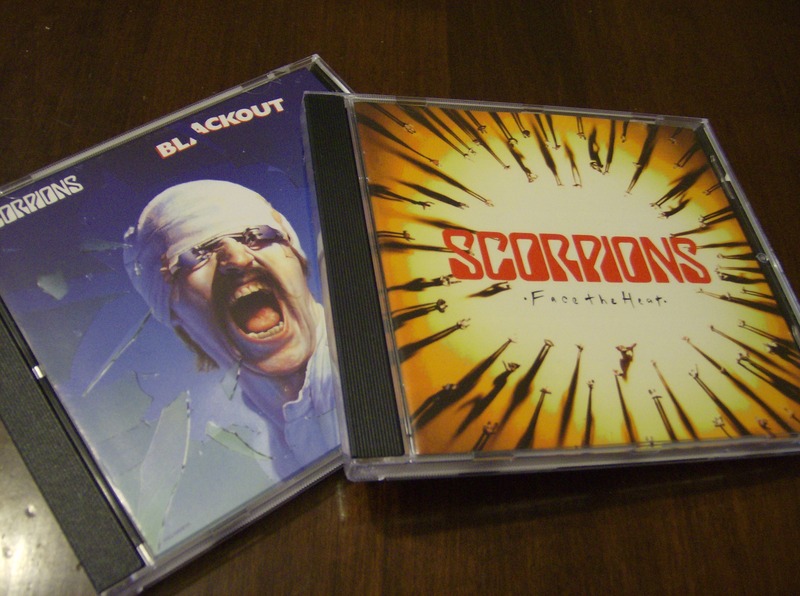 The house is going to be shaking with the sound of the Scorpions for several months to come! Crumpet was also spoiled, I gave him three presents which he has already left strewn about the house. He has a short attention span when it comes to toys, but every now and again he rediscovers them and enjoys them for five minutes or so! I was also glad that, now having a fulltime job, I was able to make a decent donation to my brother to use on his car. He has a 1981 Camaro Z28 which is not the cheapest vehicle to run nor to fix up– it’s in pieces in the garage at the moment, and I’m excited that I can help both monetarily and materially to get it back on the road in tip-top shape! 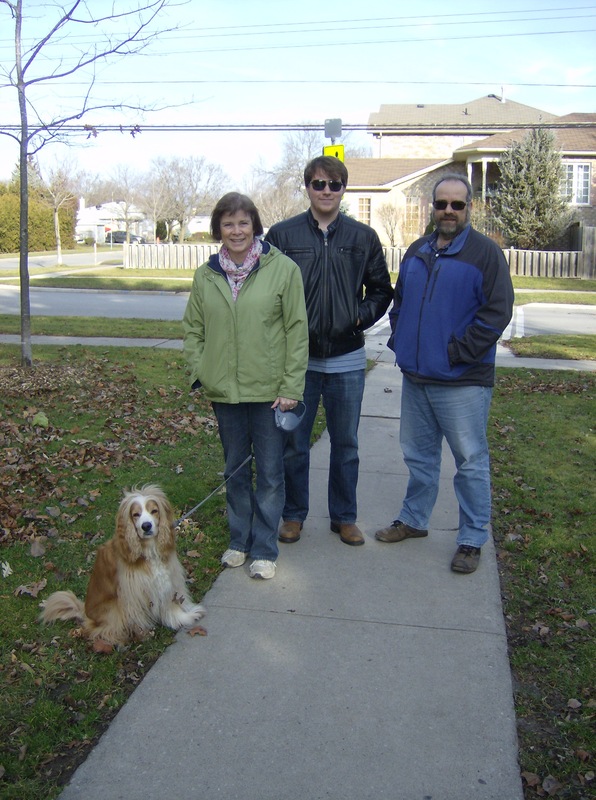 After presents, we went for our customary Christmas walk. There was no need to bundle up this year– it was about 6 above and sunny. 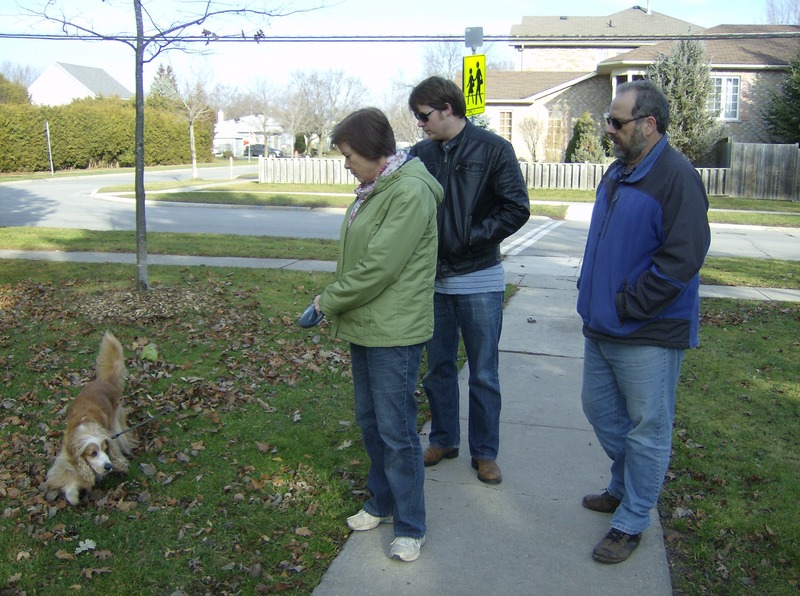 Usually I’m out in my fur coat and ushanka on Christmas, so it was an unusual walk this year! 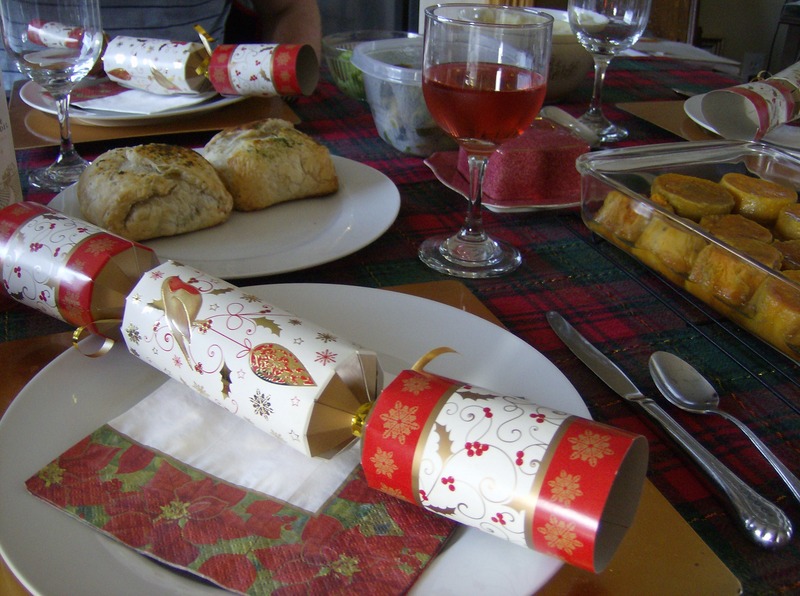 And of course, Christmas dinner was a fixture of the day. I dislike turkey, so this year I got to have beef Wellington! It was store bought, but I enjoyed it, along with some sweet potatoes, mushy peas (from rather the opposite end of the social scale to beef Wellington! ), a boiled potato just for me, and some Zinfandel. For dessert again this year, we had sticky toffee pudding– but it was gone before I could get a picture! 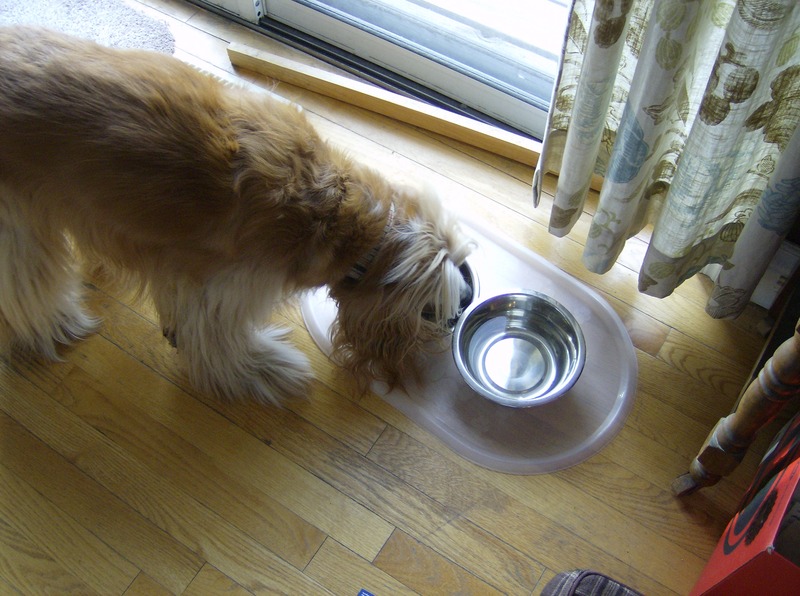 Of course Crumpet got a special Christmas dinner too! Turkey is one of his favourite foods. Once we were as full as we could get, we watched the 1951 film adaption of A Christmas Carol, and Her Majesty’s Christmas message. Both have become customs within my family and I always look forward to them! My Christmas this year, as you’ve seen, was full of good food, fun times, and cheer with the family. 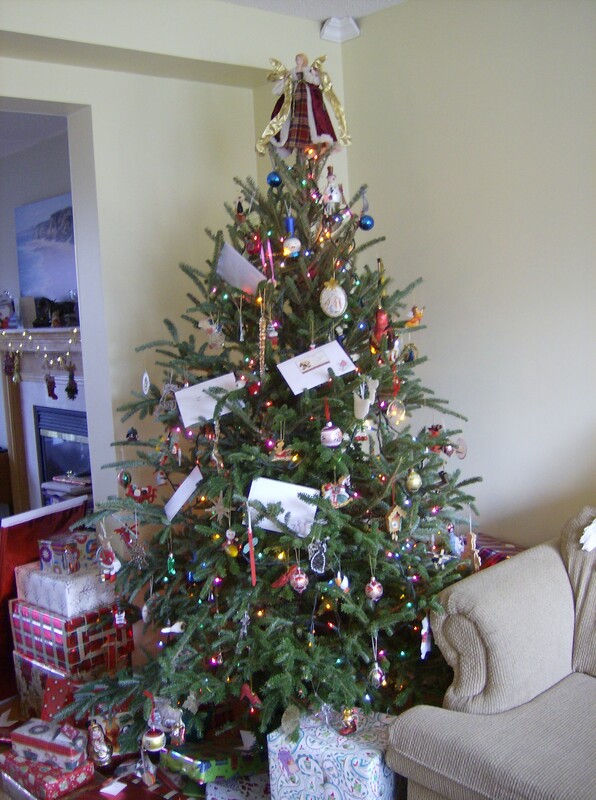 I hope that yours was as well, and I hope you’ve enjoyed this account of my green yet lovely Christmas! I first posted this musical review last year, but I just had to again this Christmastime. It’s such a wonderful story and it’s especially meaningful to me personally this year. I hope that all my readers who celebrate Christmas have a happy, peaceful, and inspiring one (just like the spirit of this story); and to everyone else I wish happiness and peace this holiday season. Merry Christmas! Some of the world’s most moving stories are those based on true events; real stories re-imagined in ways that celebrate our humanity, acknowledge our losses, and educate through our failings. This past Thursday night, I was fortunate enough to experience such a story at the debut performance of “The Child”. 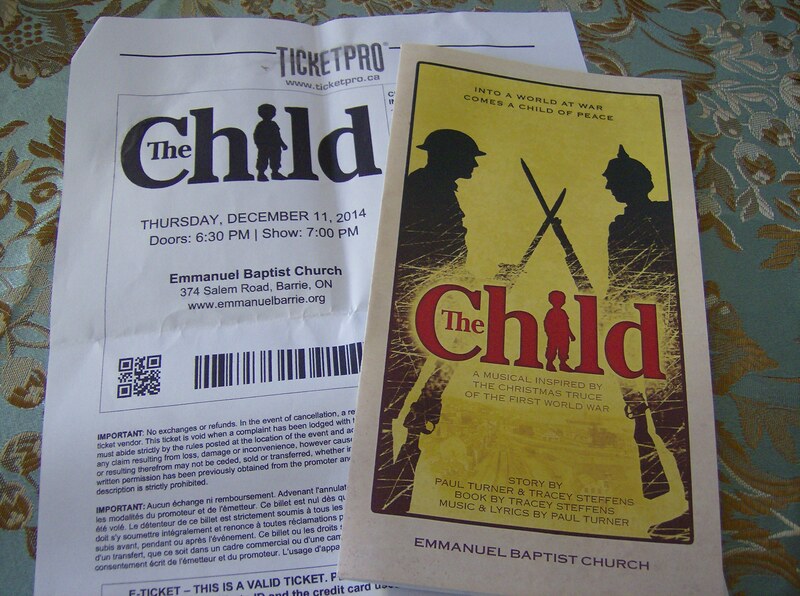 A musical production staged by my friend’s church, “The Child” was an original story inspired by the World War I Christmas truce and created entirely by members of the church. Because of the wonderfully relevant subject matter of the musical, I was really looking forward to attending. I’m sure the 1914 Christmas truce is on a lot of people’s minds this holiday season, and it has certainly been on mine. Christmas spirit always seems to be a buzzword for the Christmas season. It’s used in advertising, everyday conversation, and many a holiday song. But I think that the meaning of this term is often lost or misconstrued, and I want to convey through this post what it means to me. I’m personally guilty of misusing the phrase Christmas spirit— I often use it once I’ve decorated the house, baked a bunch of cookies, wrapped a ton of presents, and am finally feeling suitably excited for the Christmas season. I use it to mean that I’m excited about Christmas, and nothing more; and that’s really nothing close to what the term should mean! For me, Christmas symbolizes an amazing love and an amazing gift. It’s the day that Jesus the Saviour was born– He loved humanity enough to die for us, and God loved us enough to give His Son as a gift to the world. Here I’ll include a story: around Christmas, I always seem to see homeless people and it bothers me more than it does any other time of the year. I’ve seen an impoverished man within sight of the ostentation of Harrods in London, and just recently I encountered a homeless man and his dog on a concrete boulevard near the American border. I don’t like to see anyone alone and impoverished in a season so richly full of blessings, so I always try to help these people out. The man near Harrods got my change, and the man and his dog got some food from a nearby Tim Hortons. But although I can always help in some way, I never feel like it’s enough. Of course, these people are extremely appreciative and to them even a doughnut or a few dollars seems like a lot– but it’s not going to find them a job or get them warm clothes. I always feel unsatisfied, and I wish that I could do more and make everything better for them. My dissatisfaction with the injustice and sadness of the world does, however, bring more positive things to light. Even though a few dollars won’t make a huge difference, seeing the gratitude from someone who needs it reminds me of the true spirit of Christmas. Giving gifts at Christmastime has become commonplace, and the idea is great– but what isn’t great is the commercialism and flippancy with which they’re often given. I wonder how many people really need or truly want a hoverboard or Star Wars merchandise; nonetheless, millions of people will receive them because these are the trendy gifts this year. At the heart of Christmas is love, compassion, and generosity; and we should be giving gifts that really mean something, because we really care! Secondly, feeling dissatisfied and powerless reminds me of the true meaning of Christmas. I can’t do things on my own, but with God’s love and Jesus’s sacrifice I know that I can make a difference. Jesus was born 2,000 years ago so humanity could know God’s love and share in His kingdom, which is full of all the Christmas virtues of joy, goodwill, generosity, and love. It’s because of Jesus’s birth on Christmas that I don’t have to feel powerless, because I know that God’s love makes up for my human failings and inabilities. At Christmas and throughout the entire year, I take delight in being generous and doing things for other people. The mechanics at my work are pretty spoiled with cookies, coffee, lemonade, and other gifts– one of them has an especial appreciation for the Minions of Despicable Me, and I enjoy finding Minion-themed presents for him. It’s by giving gifts that I show people that I care about them, and I hope that my gestures do make a difference and brighten people’s lives. This Christmas I’m trying to have true Christmas spirit; by doing meaningful things, maintaining a positive and joyful attitude, and remembering the importance of Christmas. I often get really stressed at Christmas because there is so much to do, but this year I’m striving to be different. I’m still a bit frazzled because I haven’t written all my Christmas cards yet, but other than that I’m doing alright! I’ve realized that I’d much rather do a few wonderful, poignant things for my loved ones than do a bunch of over-the-top gestures just because I feel I should. This year, let’s rejoice in our Christmas spirit and remember the things that truly matter; and I’m sure that everyone will have the happiest and most fulfilling holiday yet! I often feel that the outfits I post here are very formulaic– the shoes and handbag are usually of the same colour, all makeup and nail polish has to match, and jewellery especially mustn’t be of varying tones or styles. But they say that if it isn’t broken, don’t fix it; and when I think about it, I realize that I have a unique personal style that I love and that others seem to appreciate as well, and that must be worth something! This party season outfit follows my usual aesthetic of dramatic colours, glamourous accessories, and a vintage feel. The Christian Dior dress with its ’40s silhouette conjures up visions of Old Hollywood when paired with the red lipstick and nail polish and the vintage fur cape. But the jewellery really makes this ensemble something special– I don’t think I’ve ever seen such ornate and beautiful jewellery, and the sparkling gems in this set of bracelet and earrings are truly breathtaking. The intricate detailing of the de la Renta shoes echoes the design of the jewellery, and ensure that this outfit (like all my others) is harmonious and carefully constructed. I hope you enjoy it as much as I do! On December 5, 2014, I self-published my first novel, A Calling Above Oneself— something of an accomplishment for a twenty-year old, if I do say so myself! That day was full of excitement, and was the culmination of a very long and confusing process for me and my mother, who helped me throughout the publishing journey. 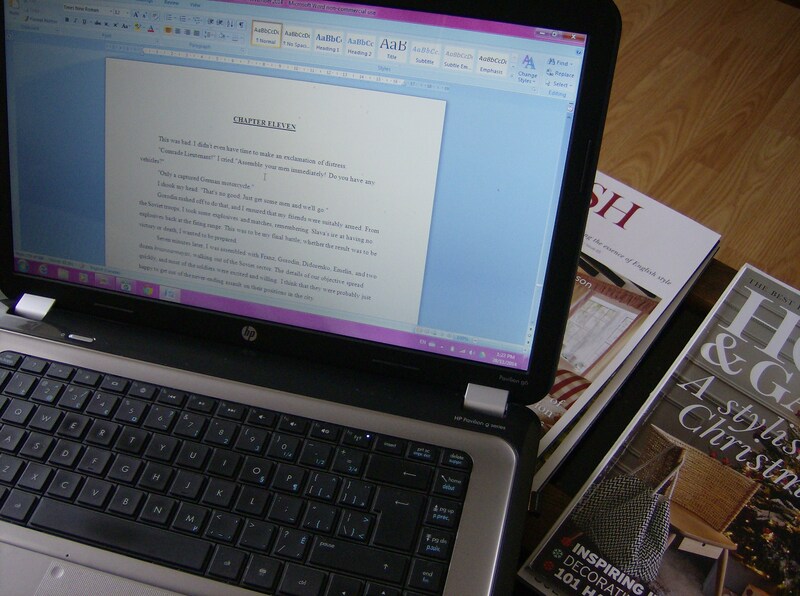 Writing the novel (although it took seven months and to some people seems daunting and impossible) was the fun part; once I got to the actual formatting and publishing part, all that enjoyment was forgotten. I remember many nights where I stayed up until midnight, laboriously Photoshopping my book’s cover and trying to format the book appropriately. It was not my kind of work, and it was not fun. I am extremely proud of my novel’s cover. I had a vision, and although my Photoshop skills are hardly anything special, I was able to make it a reality! Once you read the novel, every element of the cover makes sense. But I got through it, and my book was finally born. It was the most surreal and exciting feeling to know that something I had created and felt so strongly about was free in the world! 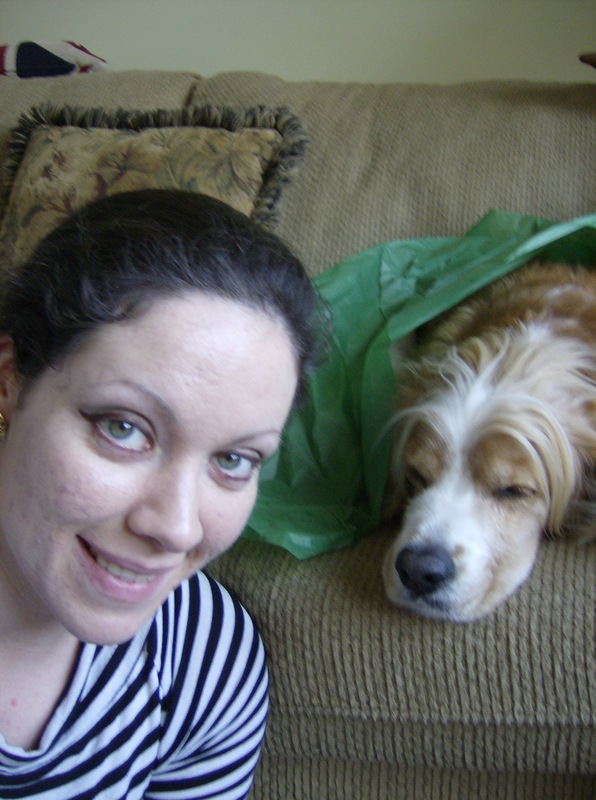 Of course, after publishing it, I had to focus on marketing; which is also incredibly difficult for me. But I hoped that my book would sell. To be honest, it hasn’t; but nor has this past year been what I planned in other areas either. Eight months ago, I started working at the local Mitsubishi dealership, and have been there full-time ever since. What was supposed to be a two-week stint became a proper job; one that has taught me more than reading books ever could. My job at Mitsubishi isn’t a normal 9 to 5 job, it’s more of an 8 to whenever-the-work-is-finished one, so I don’t have time to write like I used to. Even finding time to write a post a week here can be challenging. But I feel that through Mitsubishi, I’ve become the person I’m meant to be but was too scared to become; and I’ve also been reminded that my writing is a very important part of my life. Since working at Mitsubishi, my focus with writing has shifted. Whereas before I was concerned with how I was going to be able to support myself with such slow novel sales, now I care more about simply getting my novel out there. I feel so strongly about this story and its theme of the Eastern Front, and I believe that A Calling Above Oneself offers so much that modern readers will appreciate. Its protagonist is a young woman who strays from the normal roles for women in World War II; it sheds light on the struggle of a nation that is often misunderstood and overlooked in the West; and its themes of courage, determination, loss, and self-sacrifice add depth to what I believe is a compelling historical adventure story. At this point, I am just genuinely eager for people to read A Calling Above Oneself. Although my life is very different now than it was when I published my novel a year ago, some things are the same. While I have less time for it now, I’m still just as passionate about my writing– and especially about A Calling Above Oneself. It’s an accomplishment that I couldn’t be more proud of, and I hope that it contributes to raising awareness of the Eastern Front. I do urge you to read it– it never takes me more than a few days to read so it doesn’t require enormous commitment on the part of the reader, and it really is a fascinating and unique story. It offers an honest look at one of the forgotten theatres of World War II; from an honest perspective as well. Plus, I’m offering A Calling Above Oneself for free through Kobo for the week of December 5-12 so now is the time to get your copy! You can read more about my novel here; and just to clarify, my novel is an e-book but it can be read on smartphones, computers, and tablets as well as e-readers! 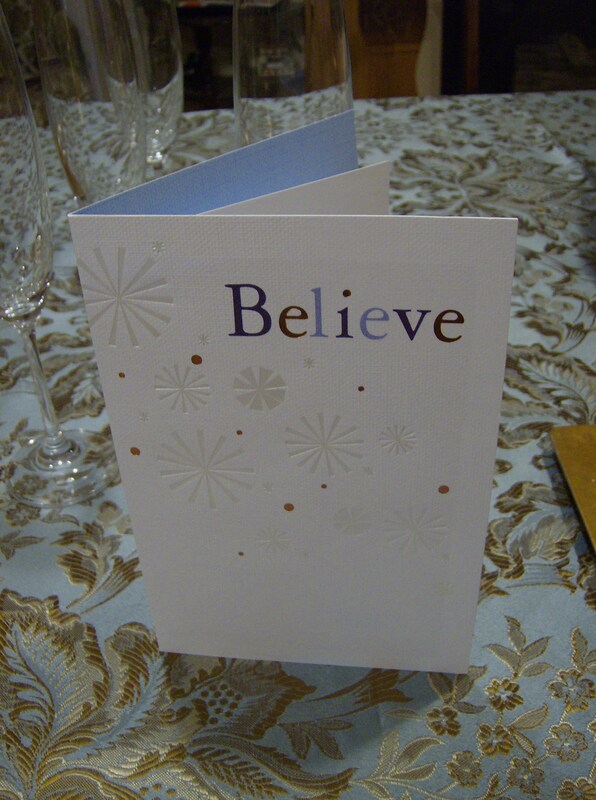 The card my parents gave me upon publishing my book. Although life is different now, I still believe in my writing dreams and I certainly believe in “A Calling Above Oneself”! The first year has been a learning experience in ways that I never expected. I am often sad that I no longer have endless time for writing, but I know that working 50 hours a week at a fast-paced, deadline-driven car dealership full of interesting characters has done nothing but help my writing. It’s enriched my knowledge of people and the way they think, and has given me so many new ideas and perspectives! Though time may now be short, I’m grateful for all the experiences I’ve had this year and I can’t wait to apply them to my next literary project.